On January 16, 2015 in the Synod of Bishops headquarters on the 93rd Street in Manhattan, the Dean of New York City Archpriest Alexander Belya conducted the meeting of clergy of the New York City Deanery. A number of clergy from most of the parishes of the Deanery, which includes the five borrows of New York City and some suburbs, were present at this gathering, and the First Hierarch of the Russian Orthodox Church Outside of Russia Metropolitan Hilarion and Bishop Nicholas of Manhattan also participated in this forum. Some current events taking place in the Deanery and in the Church in general, as well as some administrative issues, were discussed under the leadership of Metropolitan Hilarion and Archpriest Alexander Belya. As an essential component of the meeting, Hieromonk Photius delivered a lecture and moderated a discussion focusing on the connection between the holydays of the Nativity of the Lord and Theophany, their common theological and historical roots, and rich liturgical traditions. 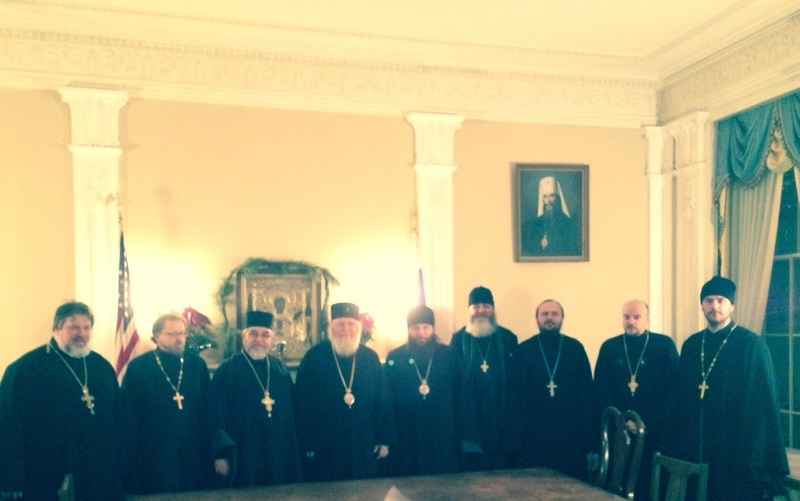 In conclusion of the meeting the hierarchs and the clergy expressed their gratitude to Fr. Photius for delivering an excellent lecture and facilitating a very spiritually and educationally enriching discussion, and also to Fr. Alexander for making this gathering and the discussion forum possible. The clergy were very enthusiastic about the idea of conducting similar meetings of the Deanery in the future, and Bishop Nicholas recommended publishing some of the materials presented. The participants emphasized that they look forward towards the next similar gathering of the clergy.